Today, our nation marks the 50th anniversary of Rev. Martin Luther King Jr.’s assassination. Last month, we joined colleagues from both sides of the aisle on the Faith and Politics Institute’s annual Civil Rights pilgrimage to pay tribute to King and remember his legacy. Visiting Selma, Montgomery and Memphis on a journey led by our colleague, Civil Rights hero Rep. John Lewis of Georgia, reinvigorated our determination to fight for civil rights and equality in Congress. Standing in Memphis at the site of King’s murder imbued us with a sense of responsibility to carry on the work he led. Though we grew up a generation apart, the legacy of King and the Civil Rights Movement holds a sacred place in our common calling to public service. Such is the power of King’s vision and Representative Lewis’ determined spirit, which, along with the sacrifices of so many individuals and groups, inspires Americans of every background to work toward completing the unfinished work of the Civil Rights Movement. Both of us entered public service and ran for Congress because of this legacy and this inspiration. When we visited Dexter Avenue Baptist Church in Montgomery, where King preached, his son Martin Luther King III made clear that, five decades after his father’s assassination, our nation has still not fully answered his call for “eternal hostility to poverty, racism and militarism.” This mission must be the core of Congress’ work. We still have much to do to protect the voting rights of minorities. The Voting Rights Act (VRA) was a seminal achievement of the Civil Rights movement. After the Supreme Court struck down a key section of the 1965 Voting Rights Act, however, several states have enacted laws — including discriminatory voter-ID laws — resulting in African-American turnout decreasing by 8.6 percent, Latino turnout by 9 percent and Asian-American turnout by 12.5 percent. Meanwhile, progress on poverty remains dismal. According to a new report, African-Americans are worse off economically according to many key indicators than during the time of the Civil Rights Movement. The black unemployment rate was 7.5 percent last year, compared with 6.7 percent in 1968 — and has held steady at double the white unemployment rate since King’s March on Washington in 1963. Our efforts in Congress must fulfill King’s call for a job for everyone who wishes to work, including training for the next generation of jobs. We have a responsibility to invest in schools in black neighborhoods and in historically black colleges and universities. Furthermore, we must address the challenge of drug enforcement disparities and police brutality in black communities. The militarism King opposed is still on the rise. The current president threatens to draw America into new conflicts, and Republicans in Congress have tried shifting spending to our military budget at the expense of critical domestic priorities. Democrats must continue to stand up for King’s legacy by advocating strategic choices abroad and nation-building at home. At the same time, new fronts have opened in the battle for civil rights. Young immigrants and DREAMers — such as Maira Velasquez, who joined our pilgrimage — are denied basic rights. Arriving with her parents when she was just four years old, Maira worked hard and is now on her way to law school. But she is prohibited from receiving financial aid and is forced to pay thousands of dollars in fees just to live in the country she calls home. The Civil Rights movement created the conditions that enabled passage of the 1965 immigration law, which ended racial quotas for those seeking to become Americans. This permitted the parents of one of us to move here and make his story possible, joining those like the other, whose father immigrated to this country in the earlier part of the 20th century. But like many aspects of King’s dream, progress has stalled, with an upsurge in xenophobia threatening to excise American values from America’s policies. 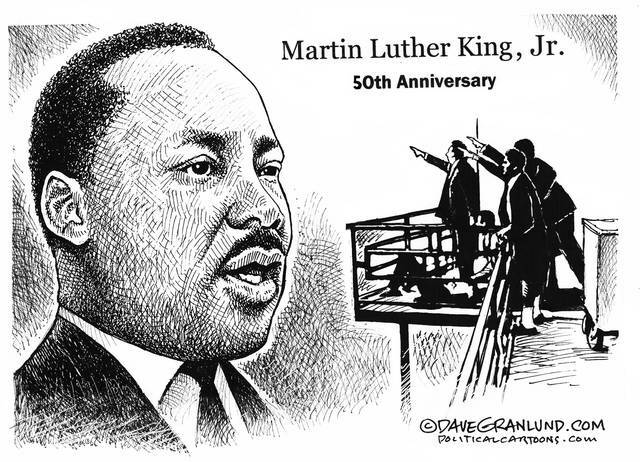 Ending his sermon in Montgomery, Martin Luther King III called out to each of us, regardless of generation, and said we should measure ourselves by Horace Mann’s yardstick: “Be ashamed to die until you have won some victory for humanity.” Congress must be a place where humanity prevails. Together we’re going to keep working to carry on the legacy of Martin Luther King Jr. and his fellow Civil Rights heroes so that our laws and policies reflect the vision of justice, equality and broad access to opportunity for which they sacrificed. Rep. Steny Hoyer, a Southern Maryland Democrat, is House minority whip. Rep. Ro Khanna is a California Democrat. They wrote this for the Baltimore Sun. It does not necessarily reflect the opinion of the The Lima News editorial board or AIM Media, owner of The Lima News.